I made this card for my mom. She and my littelest brother came over yesterday for dinner and I grilled pork chops on my new charcoal grill. It was the second time that I had used it. It all went very smoothly and dinner was great, but I can’t say that about the first time that I used it. Last Monday on Memorial Day I had my mom and grandmother out for a cook out to use my brand new charcoal grill! The night before Bert and I stayed up late putting the grill together. The next morning I was so excited to use it. I could hardly wait for Mom and Grandmother to arrive. Bert and I set the grill up in the back yard and when Mom got here I was ready with charcoal in hand for her to help me get it going. This card was easy to make. I used the green from The Angel Company’s Cha Cha cardstock and a patterned piece from the Cha Cha 12×12 Cardstock Collection. I just love the vibrant colors. They reminded me of the hot coals and flames. Then I used the vintage Stampin’ Up! 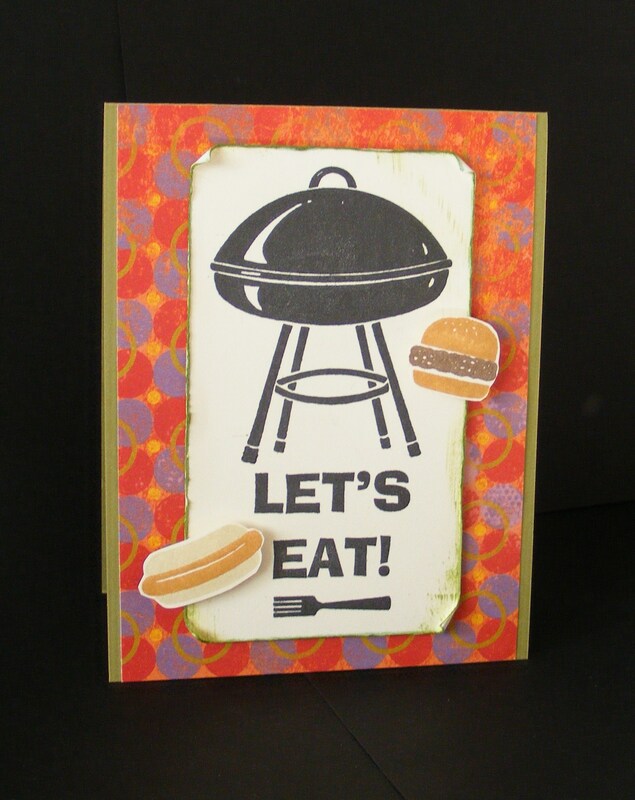 set Bar-B-Que Fun to stamp the grill and “Let’s Eat!” on a Ivory cardstock panel with Noir Palette Ink. I distressed the edges of the Ivory panel and used the “direct to paper” method to apply Landscape Palette Ink to the edges. I adhered it to the card base using Pop Dots. I cut out the stamped hamburger and hot dog and adhered them with Pop Dots also. It is a simple card and I know my mom will love it. This entry was posted in Cards and tagged Bar-B-Que, greeting card, Grill, rubber stamping, The Angel Company. Bookmark the permalink.